Greens and the wonderful superfood aloe vera combine for one super healthy smoothie. Most people are familiar with using aloe vera topically. It’s great for burns, sunburn, rashes, acne, poison ivy, and a host of other skin conditions. 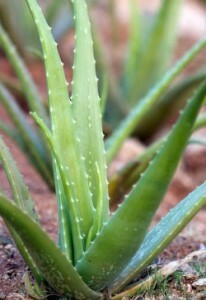 But the real magic and health benefits of aloe are experienced by those who consume it. The gel of raw aloe contains a bevy of vitamins and minerals, antioxidants, fiber, amino acids, enzymes, and the all important polysaccharides. The super nutrient profile of aloe helps with weight loss, reducing inflammation, heart disease, diabetes, and is anti-cancerous. Aloe vera also help you stay hydrated, is good for your kidneys, and supports the liver’s production of the powerful antioxidant glutathione. Aloe is truly a beautifying and health promoting superfood, for your inside and out. Freshly filleted aloe is your best bet, but store bought gels and liquids are good too. Aloe is also easy to grow and great to have on hand should you burn yourself, run through a patch of poison ivy, or if you feel like blending up a delicious aloe vera smoothie. The latter being my top reason for having an aloe plant around the house. I’d love to know if you tried this supergreen aloe smoothie – please do tell in the comments below. Happy Blending! I have been earnestly reading your site for a couple hours now. I’ve been looking for a way to ingest aloe vera since I discovered it’s ability to boost the absorption of your vitamins(among the many other benefits mentioned above, of course), but frankly, its disgusting. I’m looking forward to hiding it in a smoothie. Thanks for the feedback. Now that I look at the recipe again I realize it can be quite bitter. I used Boku superfood powder which has some sweetness and a big dollop of honey. I’m also more attuned to bitterness. 1/3c seems like way too much aloe vera. A teaspoon or 2 is plenty! Thank you for the recipe otherwise. Also trying to incorporate aloe vera into our lives other than external reasons!! If you’re new to aloe it’s probably a good idea to work up to that much.